이 불국사 삼장보살도는 1739년 밀기(密機), 채원(彩元), 서징(瑞澄) 등이 경주 거동사(巨洞寺) 오주암(五周庵)에서 제작하여 불영사에 봉안하였다는 분명한 화기를 남기고 있어 18세기 전반기 삼장보살도 도상 및 화풍연구에 중요한 자료이다. 특히 천장보살이 범협(梵夾)같은 지물을 들고 있다든가, 지지보살과 지장보살의 협시가 좌우 대칭을 이루며 무장형의 인물을 배치하였다든가 하는 점은 이 삼장보살도가『오종범음집(五種梵音集)』을 근거로 하여 제작되었을 가능성을 보이고 있으며, 또한 팔공산 지역과 구미, 상주 일원의 경북 중북부 지역의 결합된 화풍을 담고 있다는 사실에서 중요한 의의를 갖는다. 더불어 삼존을 동일선상에 수평으로 나란히 앉힌 구도는 시각적으로 안정을 구가하며, 인물의 세부 묘사력도 섬세하고 정취하다. 명도는 낮고 채도가 높은 붉은색과 녹색, 황색, 육색 계통을 주조 색으로 사용하여 종교회화가 지향하는 숭고함과 장엄함을 잘 표출하였다. 물론 앞선 시기의 담백한 담채풍의 맑고 명랑한 색채감에 비해 좀 더 짙고 탁해진 느낌은 있지만, 이는 시대적 미의식과 작가의 취향 등이 반영된 결과로 볼 수 있다. 구사된 선묘는 주로 변화가 드문 일정한 선을 사용하였으나, 머뭇거림 없는 붓질도 유려하여 생동감이 넘친다. 강조색으로 사용된 백색은 색감이 또렷하게 돌출되어 평면적인 화면에 입체감을 부여한 점도 기법상 주목할 만하다. 이렇듯 이 삼장보살도는 모든 면에서 18세기 전반기 불화를 대표할 만한 작품이며, 이 시기 화풍 및 삼장보살도의 도상 등 불화 연구하는데 중요한 자료이다. 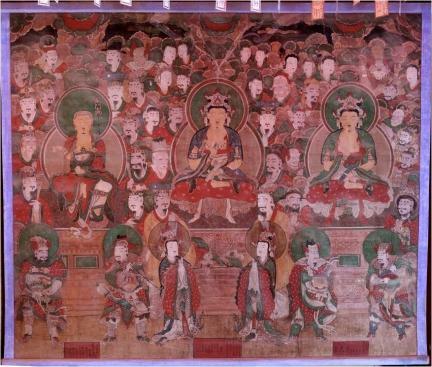 This Buddhist painting of three bodhisattvas enshrined at Bulguksa Temple contains a postscript showing that it was painted in 1739 by a group of monk-artists including Milgi, Chaewon and Seojing. The painting was done at Ojuam, a hermitage affiliated with Geodongsa Temple in Gyeongju, after which it was enshrined at Buryeongsa Temple. The artists used vivid white to highlight the figures around the triad, thereby producing an impressive three-dimensional effect. The record of the background to the painting and the careful layout and elaborate depiction of the figures make it a representative Buddhist painting of the early eighteenth century, and provide valuable information for the study of Buddhist paintings in this period.